Alec Leckey is a Research Scientist in the Intel Labs organisation. His areas of research include Software Defined Infrastructure, distributed computing and Fog/Edge Computing. He has been working on EU Framework projects since 2004 contributing to GENIUS (FP5), iClass (FP6) and PERSIST, SOCIETIES, NetIDE (FP7), mF2C, RECAP (H2020). He instructs a class on Intellectual Property generation and harvesting, and has several patents filed. 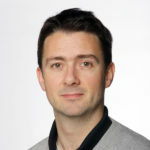 Alec graduated from National University of Ireland, Maynooth with an MSc in Software Engineering and has a BA from UCD.